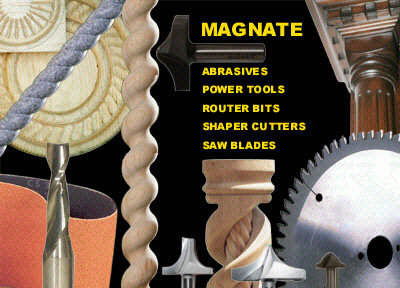 Magnate entered the mail order catalog business in 1990 to provide woodworkers with a complete, one-stop source for all their woodworking / metalworking tools. We seek to provide high quality tools at competitive prices through manufacturing under the Magnate brand or through partnering with recognized industry leaders. No tool makes it into our catalog without being measured against our exacting standards of manufacturing quality and cost effectiveness. The range and diversity of our products is as impressive as the low cost and high quality. Professionals and hobbyist alike will be hard pressed to find a greater variety of tools under one roof. A small sampling of our products include router bits, drill bits, circular saw blades, and band saw blades; table saws, belt sanders, cut off saws, and jointers; wide belt sanders, rip saws, dust collection systems, and boring machines; and even CNC milling machines. All of our product lines come in wide ranges of capacity so that you will find tools sized for your particular work space and needs whether you are a hobbyist's or run a full production shop. Woodworkers at all levels of proficiency can feel confident when purchasing from Magnate that they will receive the right tools at the right prices.